After first hearing about the project late last fall during the American Film Market, the drama 99 Homes from director Ramin Bahrani (At Any Price) will premiere at the Venice Film Festival later this month, not to mention screening at the Toronto International Film Festival in September. The films tars Andrew Garfield (The Amazing Spider-Man) as a desperate blue-collar construction worker whose family is evicted when the bank forecloses on their home during the economic downturn. Michael Shannon (Man of Steel) plays a crooked real estate worker who has a risky deal to help Garfield get his house back. Look below! 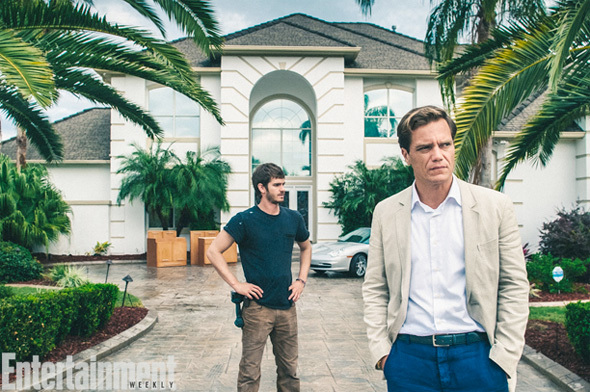 99 Homes is directed by Ramin Bahrani and written by Amir Naderi and Bahareh Azimi‐Khoie. The story follows an unemployed contractor (Andrew Garfield) who gets evicted from his family home with his mother and his nine‐year old son. Desperate to get his home back, he strikes a deal to work for the powerful, greedy, charming, gun‐toting real estate broker (Michael Shannon) who evicted him. While it puts a roof over his son’s head, becoming the broker’s apprentice puts the contractor in a moral bind where he must decide if providing a home for his family is worth sacrificing his soul and values. The film premieres at the Venice Film Festival next month and hits TIFF in September but doesn't have an official release date yet. Shannon as a villain? NO!! !